It’s amazing how much flavour there is in the not-so-humble organic carrot! Put the organic carrots and onions into a roasting tin and add the olive oil, tossing to coat. Add the herb sprigs and roast for 20 minutes, or until the carrots are tender. Meanwhile, roll out the pastry into a rectangle measuring approximately 35x25cm. Transfer to a lightly greased baking sheet. Using a sharp knife, score a border about 3cm from the edges of the pastry, without cutting right through. Brush this border with the beaten egg mixture. Allow the organic carrots and onions to cool, removing the herb sprigs. Stir in the balsamic vinegar with a little salt and pepper and toss together. 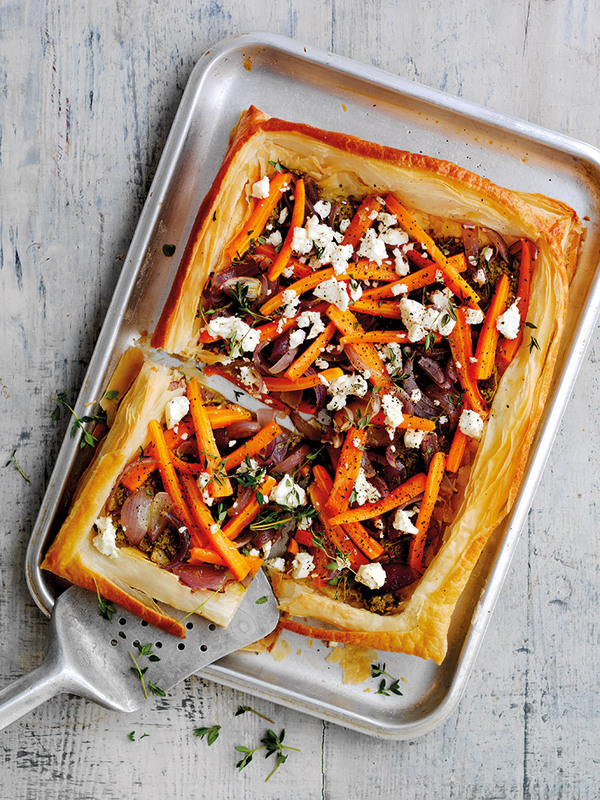 While the organic carrots are cooling, bake the pastry for 20-25 minutes until risen and golden. Gently press down the pastry within the border. Spread the pesto sauce over this area, then arrange the roasted organic carrots and onion on top. Crumble over the feta cheese and bake for a further 5 minutes. Serve, garnished with rosemary or thyme sprigs. Cook’s tip: Use regular onions if you don’t have red ones. Use organic ingredients where possible.